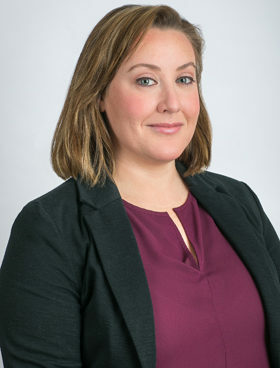 Sarah P. Burdick is an associate attorney and works with the Legal Defense of Peace Officers Practice Group, the Litigation, and Criminal Defense Practice Groups. Sarah represents peace officers in administrative investigations, disciplinary appeals, critical incident investigations and criminal investigations. Sarah has earned a reputation as a tireless advocate for the firm’s clients and has put together an impressive string of victories. Sarah is a Judge Pro Tem in San Mateo County, regularly running both the traffic and small claims calendars at the main Redwood City Courthouse. Sarah is involved with many volunteer causes. Sarah is on the executive board of the San Mateo County First Responders Chapter of the Lion’s Club, a first-of-its-kind club in the nation focused on first responders and providing service and support for the needs and causes of first responders and their families. Sarah is also an attorney-coach for the Terra Nova Mock Trial Competition Team for the San Mateo County Bar Association. Prior to joining Rains Lucia Stern St. Phalle & Silver, Sarah worked as a Deputy District Attorney in San Mateo County where she tried numerous felony and misdemeanor cases, specializing in prosecution of drug and gang cases. In 2016, Sarah was selected for inclusion in the Southern California SuperLawyers list. Sarah graduated from Warren College at the University of California, San Diego, with a major degree in Cognitive Science and a minor awarded in Political Science. After a brief career in politics she earned her law degree from University of California, Hastings College of the Law.